Have you ever wanted to stay at a fancy resort in your own city but can’t afford to stay the night in one of the rooms? Did you know you can enjoy a resort without booking a room? With Resort Pass, you can spend a day at any participating resort around the United States! To purchase your pass go to their website at resortpass.com. I discovered Resort Pass as an advertisement on Facebook. I have no affiliation with the company and am receiving no compensation for this endorsement. I genuinely thought this was a great idea and had a nice, relaxing time at one of San Antonio’s resorts because of this company. When you visit the website, select the city you want to visit or your hometown. San Antonio has two participating resorts: Hyatt Regency Hill Country Resort & Spa and La Cantera Resort & Spa. Prices and what is included in your pass depends on the location you choose. For example, the day pass at La Cantera is $10 more than Hyatt. Both resorts have the option of renting a cabana for $200, and includes all the amenities that come with a day pass. But the Hyatt offers a Spa Pass in addition to the day pass. When you purchase your day pass, you’ll select the number of people/passes and a date. You’ll need to provide names of guests, too. Adults will need to bring their IDs with them to pick up their passes. I chose to spend the day at La Cantera Resort & Spa with a friend of mine who lives in Austin. I had never been to this hotel and figured this was a great excuse to see if it lives up to the hype. If you’re interested in staying at this resort, go to the La Cantera Resort website here. When you arrive, walk towards the Check-In counter to the Concierge desk. This is where you check in. Show your reservation email and ID to receive your wrist band and keys for the gates on the property. We didn’t have to check out or return the keys when we were done, but you should confirm this with the concierge just to be sure. *The Resort Pass website states the pass gives you access to 4 pools. I only count 3 pools: resort’s main pool, adult infinity pool, and the children’s pool with slide. There is a pool within the resort’s spa (which is across from the resort facing downtown) but the pass does not give you access to the Spa. We ate breakfast before driving to La Cantera, but eating at the resort is always an option. My friend and I parked and walked a short ways to the lobby of the hotel. The concierge’s desk was to the left of the check-in counter. We showed our IDs, got wrist bands, and a key to the gates on the property. Then we were ready for a day of relaxing in the sun. It was a perfect day, too. With temperatures reaching 100 degrees, sitting pool side was really the only thing you can do, aside from sitting inside. My friend and I went straight for the pool, with a quick stop in the restrooms to change. If I had done things differently, I probably would have worn my suit there since there are no changing rooms on site. Once we were changed, we headed down to the Adult Only Pool. This is the infinity pool with views over the golf course. We were able to find lounge chairs with an umbrella, close to the water’s edge, making it easy to switch from lounge chair to pool chair when we got too hot. When you’re on vacation, drinking adult beverages is okay pretty much at any time of day, but I prefer to wait until noon. I’m weird that way. Luckily, it was already 11 am when we arrived. So I didn’t have to wait long to order a beer from the waiter. That pretty much sums up the rest of the day. Lounging, drinking, standing along the infinity edge, and doing absolutely nothing else. The pool was pretty empty for most of the day, too. Around 4 pm we decided it’d be wise to eat some food, so we dried off and went back up to the hotel. Sweetfire Kitchen offered more bang for your buck, so that’s why we chose to leave the pool area. I got pizza and a lot of water. Then we returned to the pool. Once rush hour was over, we decided to end our day at the resort. If you have the time, I suggest staying until sunset. 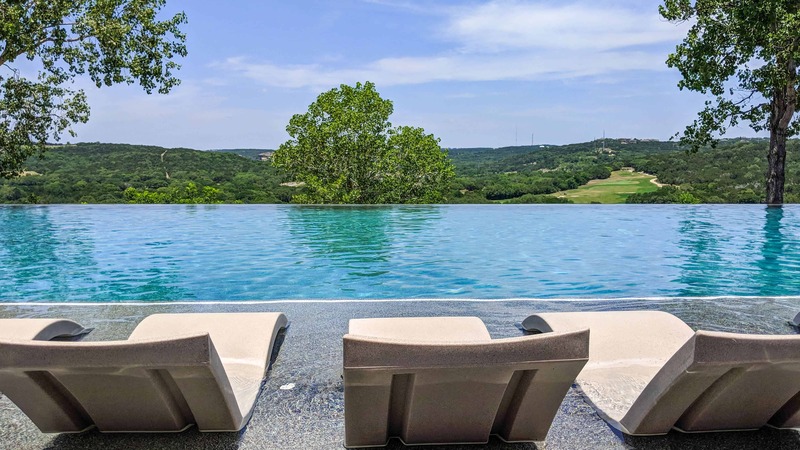 The pool and other seating options on the grounds faces the west and are meant to be used to watch the sun set over the Texas hills. You can borrow hotel towels. I brought my own (one less towel for the hotel to clean) but if you prefer to borrow one, all you need to give at the pick up counter is your telephone number. Food and drinks are expensive. It’s a resort so this should be expected, but be prepared to pay more than your $45 day pass fee if you plan on having some adult drinks. Parking can feel like a far walk in the summer heat. The self-parking is behind the resort. When you drive onto the property, continue beyond the Clubhouse until you reach the Main Entrance of the Resort. Continue driving straight until you reach the parking lot. Shuttles were available when we visited, but chose to walk instead. On the Resort Pass website, there are mixed reviews for La Cantera. Some people had excellent service while others commented on the lack thereof. My friend and I spent a Tuesday at the hotel, from 11 am until 6 pm and found the service to be fine. Nothing astounding but we also didn’t feel neglected, nor was the staff rude to us. (I should disclose that I knew someone on the hotel staff, but that was not a factor in my stay since I didn’t see them until the end of the day.) Point is, you never know if you’re going to visit a place on an off day or get the best treatment of your life, no matter where you go. Hopefully, whichever resort you choose using Resort Pass delivers excellent service! Have you ever used Resort Pass? Where did you spend your daycation?